First, and most important, what is your gut feeling about the person? Do you have a good rapport with him or her, even without a personal meeting? Do you respect the person's reputation and experience? Has this person “walked in your shoes” before? Has this person been a lawyer (not just held a law degree but been a practicing lawyer for a significant number of years)? If your emphasis is purely marketing, then a person with marketing skills will suffice, but a coach who has not practiced as a lawyer must still be familiar with the rules of professional conduct. If your coach formerly practiced law, why did he or she leave the practice? It seems to me that it is disingenuous to advise individuals on being lawyers if the person didn't like the practice of law in the first place. What is the person's experience as a coach, not just as a lawyer? If you're looking for a particular expertise for example, in business or life balance or career change or marketing what is the coach's track record in this area? Does this coach believe in the value of the process so much that he or she also has his or her own coach in order to constantly improve in the coaching business? 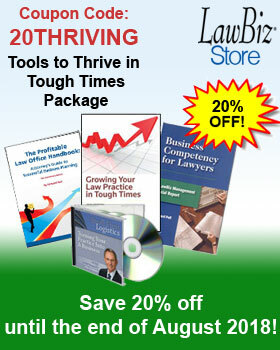 Call now to increase your law firm's revenue by calling a legal coach today at 800-837-5880.